MARVIN Morgan pressed his claims for a return to the Hartlepool United side after scoring a brace in a stunning 7-4 reserve win over Scunthorpe yesterday. Morgan hasn’t played for the first team since the 1-0 defeat at Bury in February and hasn’t even made the bench for the past three matches. But with Ryan Bird recalled by Cambridge United, boss Ronnie Moore has a vacant position to fill up front - unless he can add a new striker before tonight’s 5pm emergency loan deadline. Winger Ebby Nelson-Addy also scored twice in the reserve win at Glanford Park, to make it three consecutive wins for Sam Collins’ side. 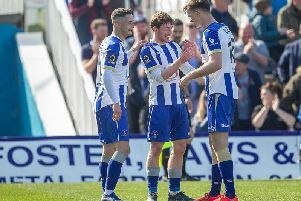 Collins named a strong team with Tommy Miller playing the full 90 minutes as he makes his way back after a lengthy spell out with a calf injury. Pools also handed starts to Sunderland trialist Jassem Sukar and Bolton midfielder Chris Lester, who scored in the win over Iron. Defender Sukar, from Hartlepool, is out of contract in the summer at the Stadium of Light and is spending time with Pools. Lester, meanwhile, is also on trial, the 20-year-old Bolton midfielder, from Salford, has also represented Northern Ireland U21s. Pools took the lead 10 minutes in through Nelson-Addy who picked the ball up 25-yards from goal, went past two defenders and slotted it into the bottom corner. Morgan then netted his first in the 21st minute, chipping the ball past Iron keeper Ben Ledger. Dave Syers pulled one back for Scunthorpe on the half-hour mark before levelling ten minutes later. Connor Smith gave Pools a 3-2 half-time lead before Nelson-Addy netted from 20 yards to make it 4-2. Miller then scored an own goal to cut the deficit before a penalty tied the scores again. Morgan then added his second before trialist Lester got in on the action from the edge of the penalty area. An own goal late on compounded Scunthorpe’s misery in the Final Third Development League fixture. Pools: Maxted, Green (Skidmore, 71), Holden, Miller, Nearney, Sukar, Lester, Nelson-Addy, Morgan, Hawkins, Smith. Subs: Elliott, Dawson, Jewson, Turnbull. l HARTLEPOOL fans have snapped up the club’s initial allocation of 1,500 tickets for the York City away match on April 11. The club is now waiting for another 500 tickets for the all-ticket fixture. Subject to availability, tickets will remain on sale from The Vic until 1.30pm on Friday, April 10.